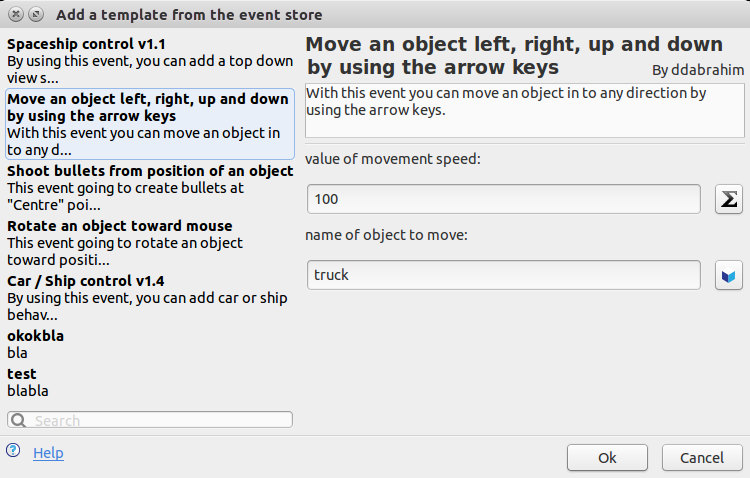 The event store give you access to events made by others users of GDevelop: you can browse the events using the list on the left and customize the event to your game using the right part, just like when your editing a condition or an action (that's why these events are also called templates). Templates are powerful because you can add complex events to your game in a few clicks: for example, some templates are very simple (like the one to rotate an object toward the mouse) and others are more advanced (like the one to add spaceship-like controls to an object). The event store is composed of two part: the list of templates on the left and, on the right, the description and the parameters of the selected template. All templates available are listed on the left: they are fetched from GDevApp.com, the online game creator based on GDevelop. Each template has a name and a description to let you know what it does: just choose a template by clicking on it. You can also enter a keyword in the search field, at the bottom of the list, to search for a specific event. After choosing a template, the entire description is shown on the right and as well as the parameters of the template. Parameters varies according to each template: some templates can have few or no parameters, other can ask you to fill lots of parameters to be used. Customize the parameters just like a condition or an action: you can either enter manually the value of the parameters or click on the buttons on the right to autocomplete them. Here, the template we've added is a very simple template that turn an object toward the mouse (or the finger on a touchscreen). You can see that all the events of the template are contained inside a group. You can click on the arrow on the left of the group to collapse the events if you don't care or want to hide the events. Even after you added a template, you can still edit it using the event store: just double click on the title of the template in the events editor. The event store will be opened again with the parameters you've entered when you inserted the template: it's really useful if you made a mistake in the name of a parameter, or if you want to change the template. Note that if the author of the template updated it, for example to enhance it or fix an issue, the template will be updated in your game after closing the event store!